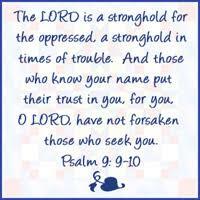 O LORD you are a stronghold for the oppressed, a stronghold in times of trouble. And those who know your name put their trust in you, for you, O LORD, have not forsaken those who seek you (Psalm 9.9-10). It is to you we come to voice our praises, and focus our prayers. That the needy shall not be forgotten and the hope of the poor shall not perish forever, we give you our praise (Psalm 9.18)! That you have sent us bountiful rains; have provided for us copiously; and have heard our cry for help and sustained us, we give you praise! That you have watched over our country in the good times and bad; have seen to the affairs of our State; and have looked after the needs and worries of our communities and families, we give you praise! We implore you to maintain your church in all places, including this congregation, New Bethel Baptist Church, New Hope Baptist, Northpointe Baptist, and Northwest Baptist Church. Bring unity where there is division; order where there is disorder; faithfulness where there is infidelity; godliness where there is impiety; Gospel where there is legalism; and forgiveness where there are grudges. Hear our Prayer, O Lord! We implore you for the nations of the world, including Uganda, Ukraine, United Arab Emirates, and the United Kingdom. Since national entities often think more highly of themselves than they ought, and seek to place themselves above you, and above justice, and above goodness, then we pray with the Psalmist: Arise, O LORD! Let not man prevail; let the nations be judged before you! Put them in fear, O LORD! Let the nations know that they are but men (Psalm 9.19-20)! For you are the LORD who sits enthroned forever; you have established your throne for justice, and you judge the world with righteousness; you judge the peoples with uprightness (Psalm 9.7-8). Hear our Prayer, O Lord! We implore you to oversee our nation, its prosperity and progress, its life and legalities. Preside over our courts, and over the appointments to judicial benches. Bring that which is genuinely good and right to dominate in our land, not Conservatism, or Liberalism, or Progressivism, or Socialism; that which is genuinely good and right for Asian, Black, Latino, White, poor, prosperous, immigrants, residents, urbanite and country folk. Hear our prayer, O Lord! We implore you to step into the ailments and treatments of those who find their cells and cerebrum failing…to take up the recovery of those who are walking in deep darkness or despair…to give strength to those who are exhausted and exasperated…to aid the insight and direction of those who are deciding on their vocational course…to comfort and console those who are grieving over their loved ones…Hear our prayer, O Lord!